Donald Trump’s main argument was that he could appeal to blue collar workers, and any Democrats who are disaffected. The idea was to reach out to Democrats and Independents, and to ignore or argue against core Republican issues, such as free trade. After all, where else could those Republicans go? To Hillary? Not likely. The problem is that Trump is an improviser, whose ad libs go off-message. Worse, he is thin skinned, so any criticism of him is met with long, drawn-out defenses, which are also off-message. Such as his attacks on the Khan family. Worst of all, he is most interested in Donald Trump, offending many people, such as by complaining about a judge in a purely private, personal lawsuit, which had no place in a political campaign—ie, questioning the integrity of the “Mexican” judge hearing his case. Trump is having such a hard time in the polls, because he has alienated many in the base of the Republican Party, without gaining as much as he expected in the Democratic faithful. Many Republicans are jumping ship, most recently Colin Powell. Reagan was much more effective at this—speaking to disaffected “Reagan Democrats,” many of whom continued to vote for down-ballot Democrats. In a country which still has a larger Democratic registration and identification, Reagan helped elect GHW Bush, and if it were not for Ross Perot, and an unfortunate economic dip, we might have had Republican presidents ever since—just as we had Democratic presidents from 1933 to 1953. The country is split in two, not just from neighborhood to neighborhood, but also, state to state. If you look at the political map, Democrats control New England and the west coast. The upper Midwest is also expected to go Democratic, from Minnesota to Pennsylvania (minus Indiana, of course). Meanwhile, Republicans have the Solid South and the vertical middle of the country—from Texas, up to North Dakota. Donald Trump once looked capable of turning the Rust Belt red. Now, two weeks before Election Day, his best hope is to turn it a lighter shade of blue. His prospects have dwindled down to just one industrial swing state — Ohio — and even that is no longer the comfortable bet for Trump it appeared to be as recently as a month ago. . .
It’s a sharp rebuke of the belief, long cherished by Trump allies, that the GOP nominee could remake the electoral map with his populist appeals on trade and immigration. . . While Trump appears to be running well in industrial areas ranging from western and northeastern Pennsylvania to northern Wisconsin, he’s falling short in the populous, affluent suburbs in those states that are vital to GOP chances of winning statewide. (Trump is poised to carry Indiana, a more reliably Republican Rust Belt locale that wasn’t considered competitive this year). Of course, realignments take time. The “Solid South” took decades to switch from Democratic to Republican. It’s quite possible, especially if our manufacturing segment continues to drag, that the Rust Belt could eventually flip to Republican. But to do this, the party would have to pursue policies that would alienate—and possibly lose—other Republican constituencies. It’s quite possible that the Republican Party could become what the old Democratic Party was, and vice versa. That is, the Solid South could align with the Rust Belt, forming a populist party, and the former Republican bulwarks—bankers, Wall Street, and big business of New England and the west coast would be the base of the Democratic party. Politics is always in flux. The sketch was called “Black Jeopardy,” with all the accouterments of the “Jeopardy” TV game show. However, all the categories were African-American topics. The thing that made the sketch outstanding was that, somehow, Tom Hanks, dressed as a “good ol’ boy” Trump supporter, complete with “Make America Great Again” cap, was included. The explanation of why he was there was that he had heard he could win some money—“git’r done!” The expectation was that Hanks would look like a moron, not understanding Black culture, and saying ludicrous things. However, that didn’t happen. The Trump supporter actually held the same views as the African-American contestants, and by the end, they fully accepted him. There was a final punchline, with the “Final Jeopardy” answer being “Lives That Matter.” Obviously, the White Trump supporter wouldn’t be expected to understand the complete Black Experience. But the rest of the sketch made a connection between the disenfranchised of differing races, which is how coalitions are built. Trump attempted to reach out to the African-American community, even claiming that he would get 95% of their vote in his re-election. But he offended them, by claiming they “live in hell,” rather than speaking of positives, such as recognizing that the ideals and ethics and dreams of the Black community are very similar to those of Whites. And he could have gone into specifics of a plan to rebuild Black communities, but that would risk alienating many of the white Democrats he wants to draw in. Many predict the implosion of the Republican Party, through a civil war that irrevocably splits the party in two, hiving off a populist Trump-like party, akin to Ross Perot’s anti-NAFTA Reform party, in the 1992 election. The Democrats relish this scenario, which let Bill Clinton win the presidency with just 43 per cent of the popular vote. But they shouldn’t. The likely loser in a new three-party system in the U.S. would be the left. If Donald Trump loses to Hillary Clinton on Nov. 8, he’s unlikely to go away and sulk. Trump now has more than 40 per cent of the electorate behind him, tens of millions of people whose fury at the establishment has been unleashed. . .[Mitt] Romney doubts the Republicans will get those voters back. Trump, who has been attacking Republicans with the same vitriol as he has Democrats, will make sure of it. . . If the 2020 “populist party” were headed by someone more like Ross Perot—also a firebrand, but without Trump’s character drawbacks—the populist candidate might win. Perot, for example, attracted both blue-collar Democrats and anti-immigration Republicans, and at one point in the 1992 presidential race, actually outpolled both Bill Clinton and George H.W. Bush. This third-party candidate’s popularity was all the more remarkable, because the public was then less cynical about the mainstream parties: Almost 60% of Americans ere satisfied with the way they were governed. Today, less than half as many, 25 per cent, are satisfied, an indication of the appetite for change. . . 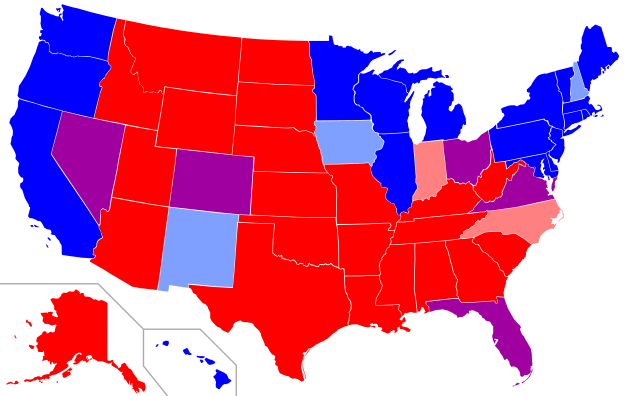 If the Republican Party does split into two, it will be in the interests of the two Republican factions to minimize the number of states—and thus, the electoral votes—that the Democrats can win, to deny the Democrats a majority. They could accomplish this by not competing against each other where doing so would ensure a Democratic victory. . .
A Republican implosion is by no means assured. A Reaganesque unifier may well emerge over the next four years, with broad appeal to Republicans of all stripes. Failing that, the three-party system may make its entrance, stage right, to the unexpected dismay of Democrats. Really? I think it’s time you update your view of this election (and that map). Utah, Arizona and Georgia are all battleground states this election, not to mention the 2nd congressional district of Nebraska. Donald is only leading in Texas by a few points, which is concerning for him when you consider that Romney won Texas by a whopping 16 points in 2012. Sure Democrats need to do a lot better on congressional and senate races in red states, but the shifting demographics of this country will only push red states into purple states going forward. The article wasn’t about “this election.” It was about long-term trends. Lol. Trump will take the usual blue color hard working ststes. A third party cannot emerge until we change the kind of ballot we use in our elections. Why is that? We already have spaces for Libertarian, Green, Socialist Labor, etc. We have those parties, but they are not competitive because the winner-take-all ballot we use enables the spoiler scenario. Recognizing that, Maine has an initiative on the ballot to institute Instant Runoff Voting for state wide and federal offices. The other 49 states and DC need to follow their lead. Isn’t “winner take all,” you know, what elections are all about? The winner take all ballot limits our choices as voters and the competition candidates must face. The spoiler scenario it creates allows plurality winners instead of majority winners. Shouldn’t the purpose of an election be to establish the will of the majority, not allow a plurality to thwart the will of the majority? So. . .you’re saying these presidents were illegitimate? JQ Adams, Abraham Lincoln, Woodrow Wilson, Bill Clinton, Richard Nixon, James Buchanan, Grover Cleveland, Zachary Taylor, Benjamin Harrison, GW Bush, Rutherford Hayes, James Garfield, Grover Cleveland (a second time), Bill Clinton (a second time), Woodrow Wilson (a second time), James Polk, Harry Truman, John Kennedy. They were all “plurality” presidents. Besides, your argument falls apart because even most of our “majority” presidents were actually “plurality” presidents, since our voting rate is so low. Why not just change the system so we’ll have unanimous votes? That would be a mandate! That is, of course, an impossibility. Care to say what your real objection is here? You’re the one who’s objecting. I’m just doubting your objection. The reason for the lack of competitiveness by third parties in the American Political system is the use of the Winner-Take-All (a.k.a. First Past the Post) Ballot, for all the reasons I’ve enumerated above. If aren’t convinced by what I have to offer, then go to FairVote.org and check out the referendum in Maine. Your use of “winner-take-all” confused the issue, since that term is mainly understood to refer to primaries in which a candidate wins the whole state’s delegation (“all”) if he or she wins a majority of the popular vote there. Anyway, I disagree with your premise that only the top two listed names could possibly win. George Wallace won the electoral votes of five states in 1968, and Ross Perot actually led in the polls in 1992, and might well have won the election, if he had not flipped out in the middle of the campaign. The reason a third party has not won has been because he or she did not have the organization, the name recognition, the money for advertising and other needs, and, well, ideas that could catch on. I think if the Republicans had nominated Ted Cruz, Trump still would have dominated the airwaves as an independent candidate, and may well have beaten both Clinton and Cruz this year. As Shakespeare said, “the fault, Dear Brutus, lies not in the stars, but in ourselves, that we are underlings.” In other words, third parties lose because their candidates and organizations are crappy, not because ballots are bad. Your final paragraph is a chicken or the egg type argument. Do third parties lose because their candidates and organizations are crappy? Or do they lose because the election system we use does not allow them to rise above being crappy? I blame the latter. And, no, I am not saying the candidates should be listed differently. Read the postings I provided. And, as you know, many states have “sore loser” laws, so Trump having been denied the Republican nomination would be ineligible to run in those states as an Independent. Further, just to confirm because you should know this, what is the difference between a majority winner and a plurality winner? But the two examples I gave–Wallace and Perot–prove that a strong voice, with a real message, can cut through the clutter. Ross Perot really might have won if he had stayed in the race, and Wallace had built a strong base, on which he might have run competitively with the major candidates the next time around. In fact, since “the next time around” would have been against George McGovern, Wallace could have drawn a lot of the centrist northern vote. No. You know States like NV would be an after thought without EC, right? I am not advocating doing away with the Electoral College, just changing how Electors are awarded. Read the posts at the links I provided above. Generally, how we do things here, is we make a point, and then provide links to support our argument. I did finally go to the links, so I could understand what you’re not saying here, so let me explain. By “winner take all,” Mr. Bradley is referring to the Electoral College, not the ballot. The whole premise of the Electoral College is to give the individual states meaning in the process. If you “win a state,” yes you are the “winner” and “take all” of the electors from that state. What you are suggesting is that the states, and the College, won’t matter. If the electors are just puppets of the popular vote, just do away with the sham College you want. Why bother to keep it at all? Also, I am not saying our system is “rigged” with those negative connotations. I am saying our system is illogical and inefficient. The current system drives us to conflict, not consensus. We have the behavior and outcomes we have from candidates and elected offficials because of the system we use to elect them. We will have the behavior so long as we use the system. If we want different behaviors and outcomes, then we have to change the system first. Otherwise we will continue to have the same unsatisfactory behaviors and outcomes we have now. It did seem that Trump was unable to dodge setups we even seen coming. Like the question, IF abortion was against the law, would he impose a punishment? And he said yes, if it was against the law I guess there should be some sort of punishment. Oh, I just wanted to reach out and stop him!!! What he should have said is that is not a question he should answer, or better yet have done a Hillary and talked about something completely different. But he isn’t a politician, and I have seen his words get used and twisted, used out of content and utterly destroyed by Hillary Clinton or her supporters. I guess if lying and cheating and deceiving the public is what politicians do they are doing a great job. ?. Then followed it up with his Paid Maternity leave.. I have hated and loved watching him on stage. I’ve winced when he’s on stage. Wanted to tell him to Stop at times. He made a good point now stop. Same here. Oh thank goodness the presidency doesn’t require constant debating. Hopefully he can work on it. Now, Pence is excellent at debating!!! You can tell how great he did. He didn’t dodge the question like Hillary or go aggressive like Kaine but stayed in a pleasant mood the whole time. I could watch him for hours debate.